I have a Delicious Homemade Mozzarella Cheese Recipe that is totally worth trying. I was shopping at our local grocery store this past weekend and the expensive cheese section grabbed my attention. They were sampling fresh gourmet cheeses. I tasted an amazing mozzarella to die for! I couldn’t believe the price for a small package of fresh mozzarella cheese. Whoa! I just had to learn how to make my own. I’ve seen tons of recipes before but now had the courage to try it myself. This process can be a bit tricky to explain but I will do my best. It’s more about the feeling than a written instruction. This process can be extremely messy too. I actually timed myself and made fresh homemade mozzarella cheese in 48 minutes! Total $7.26 for 1 batch which yielded about a pound of Fresh Mozzarella Cheese. My local grocery sells fresh mozzarella cheese for $9.98 per pound! The key to saving money will be to get the milk on sale or use a coupon when you can. I’ve not been able to find the rennet tables anywhere in the stores. I had to purchase the rennet tablets here on Amazon. I think you can find the Citric Acid in the stores though. Maybe in the canning section. 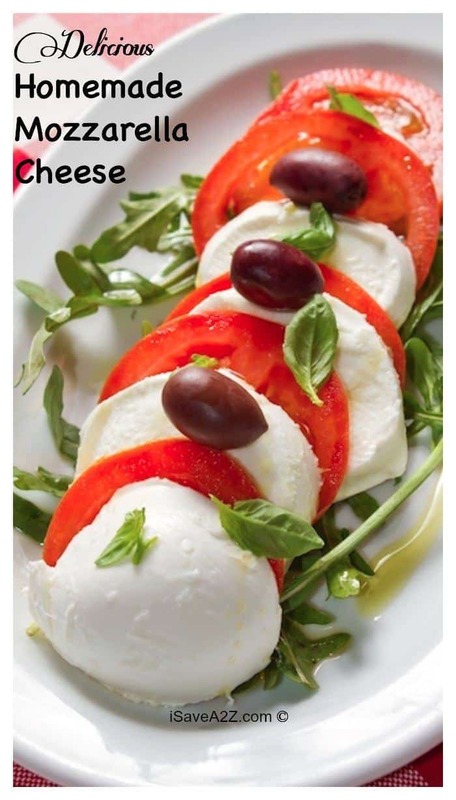 Amazing homemade Mozzarella cheese recipe! 1 Gallon of Organic Milk Must be organic – Don’t use the ultra-pasteurized milk Use whole milk or Lowfat milk to save some calories. Start off by dissolving a 1/2 Rennet tablet in 1/4 cup of water and set it aside. Start to warm the Organic Milk slowly on low. Stir in the Citric acid and stir until the heat reaches about 105 degrees. Turn the heat off and pour in the dissolved rennet water mixture. Stir for approximately 30 seconds. After it has set, run a knife through the mixture, cutting squares to break up and separate the curd from the whey. Use the stainless steal spoon to scoop out the curd and put it in the glass bowl, leaving the whey in the pot. Remove as much of the whey as you possibly can. Now for the fun part! Once the liquid as been drained, you will microwave the curd mixture on high for about one minute. Remove it from the microwave and drain the whey again. Press down on the cheese to remove as much of the whey as possible. Repeat as necessary but only microwave it for 30 seconds each time you drain it. A stainer would be helpful. I did this about 3 times. Once completely drained, start kneading the cheese until it comes together like dough. While you are kneading it add a generous pinch of salt. I would estimate this is about a teaspoon but mine could have used more like a teaspoon and a 1/2 next time. I got a bit shy with the salt. Tip: If the cheese still hasn’t come together, you will need to microwave it again and drain the whey until it does come together. I ended up microwaving it one last time for about 45 seconds for it finally to come together. Shape it into a ball and let it sit on the counter for about 10 minutes and enjoy! By Jennifer on July 13, 2016 Appetizer, Frugal Living, Main Dishes, Recipes. I always enjoy making foods from scratch, but homemade cheese seemed daunting. I think I do have to try out this recipe soon. It’s really a luxurious treat to buy fresh mozzarella from the store nowadays and not be bowled over by the price. Thanks for sharing!